I’ve been obsessed today with a photo series in which the photographer captured a portion of his friends’ lives by peering into their bags and seeing what they considered necessary enough to carry with them each day. Touted a “voyeuristic delight,” the Persona series is strikingly insightful, and extremely telling about each individual. The deeper I dove into the series — relating to some, surprised by others, realizing that we obviously are not always what we seem — it got me thinking about what my belongings say about me. It compelled me to get out my cracked iPhone and snapped a ghetto version of the contents of my bag. So tell me: what do you see? 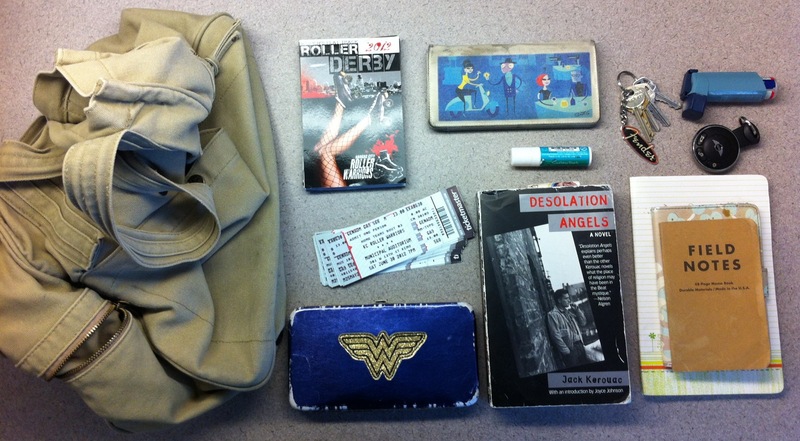 And, what do the contents of your bag say about you? It seems like you like to keep things simple and natural. You love the basics, which are a good book, a notebook to write your thoughts, and a good time which would be a roller derby match. Am I close? Absolutely! You’ll have to share yours, too. It’s so interesting. Notebook. Tape recorder. Pens. Glasses. Wallet, pocketknife, monocular. If it means writing or birding, I’m ready!! !